HomeessaysWhat is the Doomsday Clock and why should we keep track of the time? The Doomsday Clock was shifted on January 26, 2017 from three minutes to midnight to a new setting of two and a half minutes to midnight --- the nearest the clock has been to midnight for more than 50 years. That is the nearest the clock has been to midnight for more than 50 years. The body responsible for the clock said the probability of global catastrophe is very high, and the actions needed to reduce the risks of disaster must be taken very soon. It should be an urgent warning to world leaders. 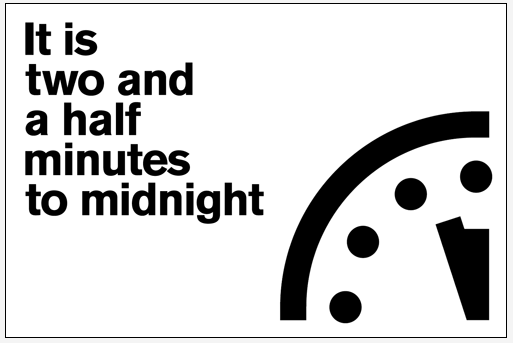 The idea of a Doomsday Clock was conceived by the editorial staff of the Bulletin of Atomic Scientists, which was founded by many of the scientists who worked on the Manhattan Project. When that publication graduated from being an internal newsletter among the nuclear science community to being a formal magazine in 1947, the clock appeared on the cover. The magazine’s founders said the clock symbolised the urgency of the nuclear dangers that we — and the broader scientific community — are trying to convey to the public and political leaders around the world. The clock was [initially] set at seven minutes to midnight. Two years later, with the news that a nuclear weapon had been tested by the USSR, the communist state centered on modern Russia, the clock was moved to 11.57. The hydrogen bomb: midnight for Western civilization? In 1953, the USA first tested the hydrogen bomb, a fusion weapon much more powerful than the fission bombs that had destroyed Hiroshima and Nagasaki. The USSR followed a few months later and the clock was advanced to 11.58 with a warning there was a real chance that from Moscow to Chicago, atomic explosions will strike midnight for Western civilization. Then there was a period of modest progress. It gradually became apparent that the new weapons were so powerful that only a deranged leader would consider using them against a similarly armed enemy, given the inevitability of catastrophic retaliation. In 1963, after they had been continuously testing more and more deadly weapons, the USA and the USSR signed the Partial Test Ban Treaty, which prohibited atmospheric testing. The clock was moved back to 11.48. It was a false dawn. The two superpowers simply shifted their testing of new weapons to underground facilities, while other countries such as Britain, France, and China developed their own nuclear arsenals. The Doomsday Clock was created in response to the development of nuclear weapons. The clock gradually moved closer and closer to midnight until the mid-1980s when it stood at 11.57. Then Mikhail Gorbachev assumed the leadership of the USSR and began a series of negotiations to ease tensions and reduce the risk of nuclear war. The fall of the Berlin Wall in 1989 effectively marked the end of the so-called Cold War between communism and capitalism. The subsequent collapse of the USSR led to large reductions in the nuclear arsenals, and by 1991 the clock had moved back to 11.43. Once again, there were optimistic hopes of an era of peace and an end to the threat of nuclear weapons. It was not to be. The political system in the U.S. made it almost impossible to scale back arms production. The Nuclear Non-Proliferation Treaty, negotiated in the 1970s, aimed to prevent the spread of weapons beyond the five nations that had already acquired them. But those countries did not implement their promise to disarm, so inevitably other nations decided that they would be more secure if they had nuclear weapons: India, Pakistan and Israel. The clock moved forward again year by year, reaching 11.53 by 2002. Since then, the managers of the Doomsday Clock have added new threats to the original fear of nuclear war. In 2007, they said “climate change also presents a dire challenge to humanity” and advanced the clock to 11.55. More recent annual reports have warned that international leaders are failing to perform their most important duty — ensuring and preserving the health and vitality of human civilization. The change should be welcomed. Even if nuclear weapons did not exist, climate change and the accelerating loss of biodiversity are serious threats. Damage to ecosystems is already taking place; climate change is causing loss of life and property, as well as affecting natural systems. At the same time, the nations with nuclear weapons are still testing new devices and more sophisticated delivery systems. The number of weapons has dropped from its peak of over 60,000 to about 10,000. But that is still enough firepower to wipe out civilisation several times over. And there are new players, including North Korea and perhaps Iran. As the 2017 report said, it is two and a half minutes to midnight, the Clock is ticking, global danger looms. Wise public officials should act immediately, guiding humanity away from the brink. If they do not, wise citizens must step forward and lead the way. This really is a call to arms and deserves more attention from our media. Reprinted with permission from The Conversation. Images added by KurzweilAI.